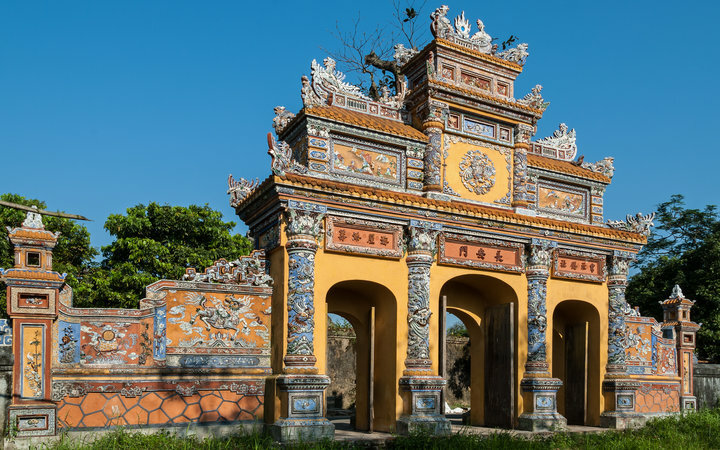 The most recent addition to our portfolio of exciting destinations is Hue, a fascinating city in the narrow centre of Vietnam, rich in history and culture. 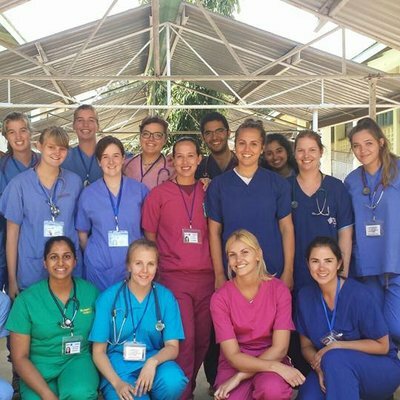 The city is the ideal place to learn and gain new experiences on your overseas healthcare placement. Once Vietnam’s monarchal capital, this typical Southeast Asian area boasts a UNESCO World Heritage title, thanks to it’s stunning monuments and impressive citadel. Modern Hue is set around the Imperial City; a walled district home to a majestic ancient palace and its grounds, including pavilions, gardens and temples. Hue is a traveller’s paradise. 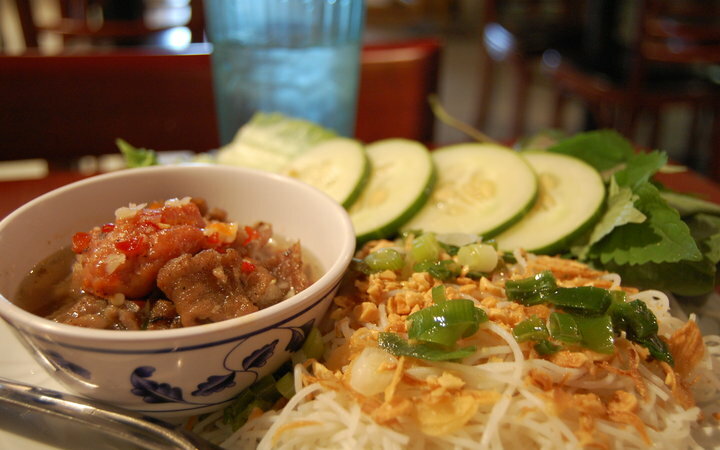 From cultural events, festivals and religious holidays, to street markets, adventure-packed excursions, and the finest Vietnamese cuisine, there’s something for every appetite. Prepare to be captivated by historical architecture and tales of the Nguyen Dynasty, the ruling family who historically lived within the 19th century citadel. The structure overlooks the Perfume River; named with the fragrant petals that fall into the water in mind. Within the walls is the Imperial City, once home to the emperor. To trespass on these grounds was historically a grave offence, but now, you can wander the grounds freely and admire the sprawling complex which has been preserved in incredible detail. Every night at 8 pm, there’s a grand cultural show within the walls, from traditional martial arts to Vietnamese dance, enjoyed by both locals and visitors alike—something you cannot miss when you’re visiting Hue. 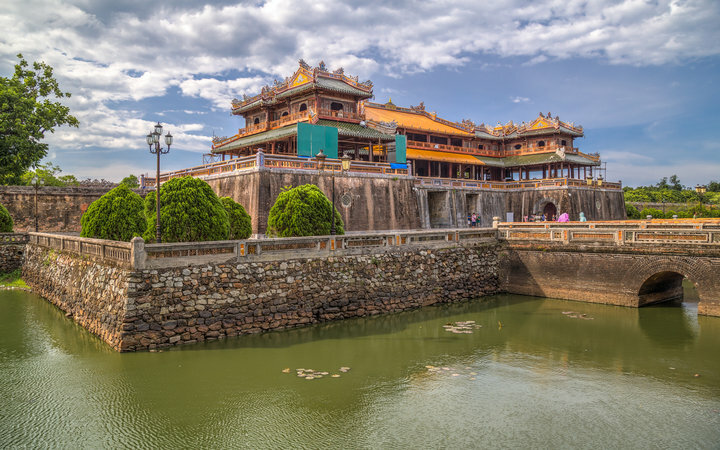 The Imperial Tombs are the final resting place of Hue’s emperors of past, most dotted along the Perfume River, all with intricate decorations, from dragons to floral carvings. 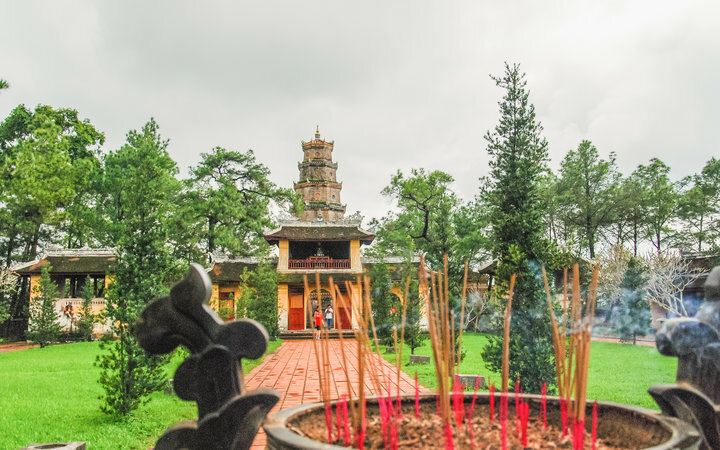 Thien Mu Pagoda is another stunning spot—watching over Hue, it’s surrounded by yet more beautiful gardens. Hue’s more modern side has just as much on offer, from delicious authentic Asian cuisine and fun backpacker bars, to nearby beaches loved by locals. After placement, you could head just half an hour away from the Work the World house to relax on the sand and enjoy a sunset, or take a tuk tuk to the Palace and admire the Changing of the Guards ceremony. You’ll be pleased to know the city acts as a great jumping off point for many areas of cultural and geographical interest. Take a long walk through the stunning Bach Ma National Park; just two hours from Hue, which has a number of waterfalls, wildlife, and trails to explore. Da Nang, an hour a half away on a scenic train journey, is the destination for a weekend of culture and fun. 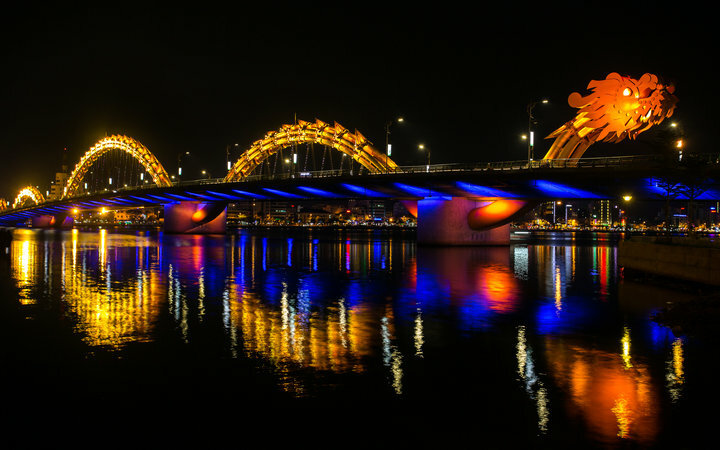 Known as the “City of Bright Lights”, Da Nang is home to bars and restaurants, as well as the most spectacular river bridge you may ever see: a huge dragon that spits fire and water in an unbelievable evening show. Da Nang also has a plethora of historical and geographical sites of significance, from the rocky limestone Marble Mountains (reached by cable car) to Mỹ Sơn, an archaeological relic over one thousand years old. Non Nuoc Beach is another local paradise; a white sandy beach, the perfect spot to relax on the weekend. In Da Nang, you can rent bikes go cycle along the shore, swim in clear waters and enjoy some of Southeast Asia’s most beautiful views. For the adventurous, a flight to Hanoi or Ho Chi Minh City is reasonably priced and a great way to explore more of Vietnam. These two cities are where East meets West and old meets new: from lively markets to shopping malls, and street food to posh restaurants. If you’re travelling after your Work the World placement has ended, these two cities act as a great stopover for Cambodia, Laos or Thailand and beyond. 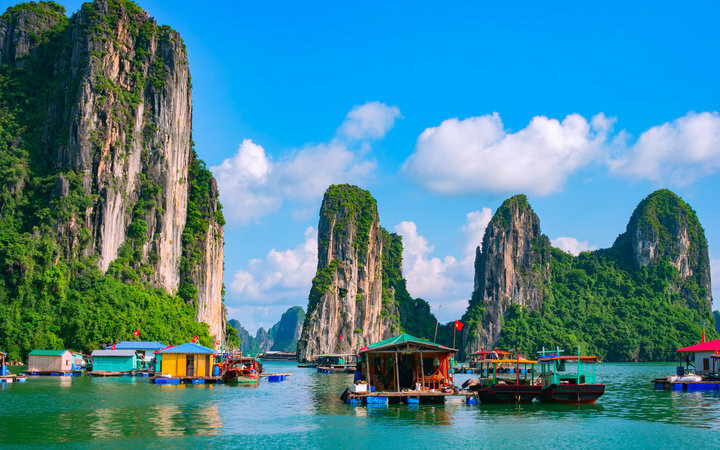 Finally, you simply cannot visit Vietnam without spending a weekend in Hạ Long Bay. Although around 12 hours from Hue, the journey is more than worth it—this UNESCO site is like nothing you’ll see anywhere else in the world. Dotted with beautiful limestone formations, the bay is home to a water-top village and enchanting caves. Purchase fresh fruit from the floating market, kayak through a cave at Cat Ba island or simply admire the “Kissing Rocks” from a dragon boat cruise. Our comfortable and sociable house in Hue is a great base for your healthcare placement in Vietnam. Your placement cost includes your stay in our private, secure house, catering from our local chef and total support from our team, who are available 24/7. Our knowledgeable in-country staff will also be able to give you tips on weekend trips and local sights to help you get the most out of your once-in-a-lifetime trip to Vietnam! In your home-from-home, you’ll get to socialise with new friends and our supportive Work the World team at the weekly BBQ, and enjoy further learning at our weekly language lessons at the house to help you get even more out of your hospital placement. To learn more about our healthcare placement opportunities in Hue, click here.